Nibiru, 2012, Myth and ancient writings. Chinese dragons are legendary creatures in Chinese mythology and folklore, but surely this concept stands for something more than just a non-existent creature? Where does the concept of a dragon come from, if not told in allegory based on genuine human experiences? Since Nibiru (Planet X) only enters our solar system once every 3650 + years or so, it’s obvious no one is alive has seen it, but those who have seen it, and survived, most certainly wrote or told stories about it. Of course, every Nibiru fly-by is also accompanied by pole-shifts of varying intensity, so story-telling and the recording of it is natural. In fact, when you research Nibiru and the pole-shift, you will find that every country in the world has some connection with Nibiru’s influence and many of these with indigenous cave drawings, stone carvings, old writings, folklore, and the essential heads for a nearby Nibiru are the “Two Suns” phenomena, this heralds the immanence of it’s passing and the pole-shift proper. Many cultures even their own name for Nibiru, the following are a few examples: Babylonians – Marduk, Sumerian – Nibiru, Aztec – Hercolubus, Christian Bible – Wormwood, The Kolbrin Bible – The Destroyer and most recently named by a early nineteenth century astronomer Percival Lowell – Planet X. Image above was taken in Utah and is called “Rock art”. Why would anyone go to the trouble to most likely carve for a day or 2 in stone with crude tools instead of tending to his/her family? This carving clearly shows a double-Sun figure, most likely Nibiru to the left of the Sun, which means it’s moving and seen like this just weeks before the pole-shift. Stratospheric lightning: Called Mega lightning, starts 9 to 12 miles above the Earth, and shoots upwards into space, reaching the upper mesosphere 60 miles up. The allegorical language of the Kolbrin can be off-putting to our senses which are steeped in modern tech and science-dominated cultures, so breaking it down: Nibiru appears as a dragon as it’s 2 moon-swirl tails are constantly on the move – writhing, the cold bright light is the stratospheric lightning, the ruddy glow is the fact that Nibiru is a hot dwarf star that glows a dull red, the trail of smoke is it’s visible-up-close massive tail, the shrill trumpeting is the sound of the stratospheric lightning. 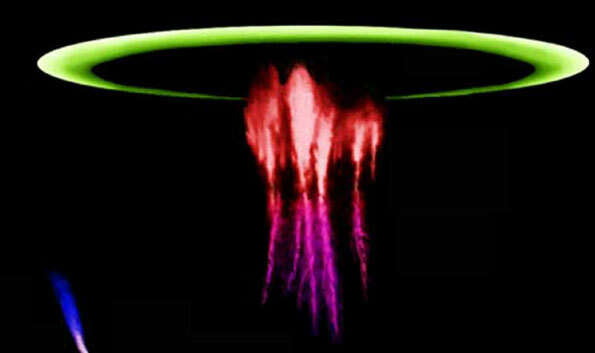 It is so interesting that we are given the detail that the stratospheric lightning is louder than the hurricane winds, the Zetas of ZetaTalk have warned us to have ear protection for this deafening sound! The Mayan calendar is a hand-me-down to the Mesoamerican peoples by the humanoid Annunaki who originally developed it as a plotting tool, yet today it is only understood as an amazingly complex calendar system, even by the Mayans themselves. From my perspective, when a concept or a belief survives for millenniums, there is some grain of truth to it. These images, the Chinese Dragon, the two sun carvings, the names for Nibiru and the story-telling ancient writings stand for something, they still exist for a very good reason. “While many people go about their lives in pursuit of the almighty dollar, they continue the tradition of forgetting their past in order to fulfill their current desires which are mainly to eat, sleep, get laid and play with their toys. Now we the Zetas understand this, but to them we say do not be surprised when Nibiru shows up on your doorstep, and it won’t bother knocking, it’ll just barge right in. Now in the end of ends those of good heart will be lifted and given great assistance in survival of this great calamity of calamities, but those who ignore these words will end in the dog-pile of debris on the shores of the world.” The Zetas. This entry was posted in History of Planet X and tagged 2012, 2012 doomsday, annunaki, dooms day, doomsday, mayan calendar, nibiru, planet x, pole shift, PoleShift, Zetatalk. Bookmark the permalink.